Magento is one of the leading open source eCommerce platforms. Most of the retailers build a powerful eCommerce website using super features of Magento store such as a flexible shopping cart system, SEO optimization & content management technology. Also, for an eCommerce website, the page load speed has always been an important aspect. And if your Magento store has more than 1000 products then even a one-second delay may cause you a significant loss. You don’t want to lose your potential customers because of the slow loading speed of your store. Always check for the updates and if any available, update your Magento to the latest version. Updates always roll out with some new features, improved performance, and fixed bugs. To update your store, check the release notes to find the updates. You can easily find it in your admin panel inbox or the navigation bar. 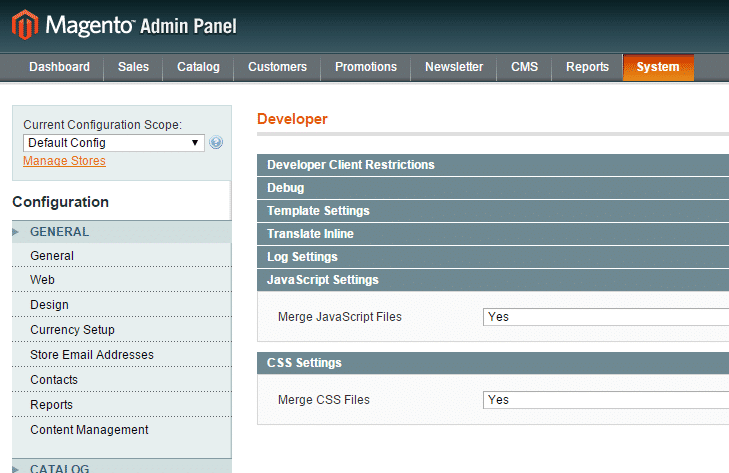 You can also update Magento by using the content manager in the backend. Before running any update, always backup your data. Launch updates on your website during the night hours or when there is the least traffic on your website to prevent any technical glitch or confusion. Magento typically stores catalog data in multiple tables, based on the Entity-Attribute-Value (EAV) model. In this data is fully in normalized form. Each column data value is stored in their respective data type table. 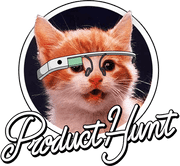 Because attributes are stored in many tables, SQL queries are sometimes long and complex as it joins 5-6 tables even if you want to get just one product’s details. The flat model uses just one table, so it’s not normalized and uses more database space. It clears the EAV overhead. Go to System —> Configuration —> Catalog —> FrontEnd and choose ‘Yes’ for the ‘ Use Flat Catalog Category’ fields. 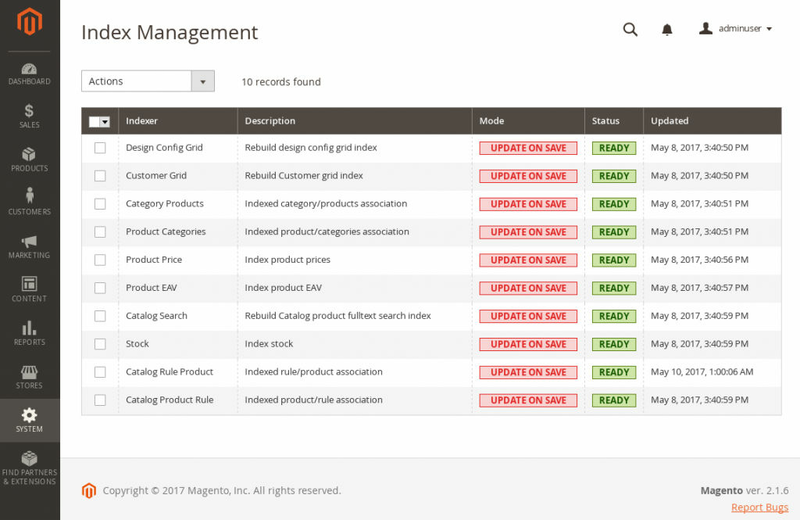 This will enable the flat catalog for the categories and products in the admin panel of your Magento store. To learn more, see: Setting Up a Flat Catalog. Magento stores the logs of best sellers or frequently read pages for 180 days and then delete all the logs from the system. This huge amount of information can increase the load on your database. So, enable the log cleaning in your admin panel. You can also choose the number of days for which logs should be stored. To do so, go to Stores —> Configuration —> Advanced —> System —> Log. Assign a value in the ‘Save Log, Days’, enable the log cleaning and then, save the changes. Indexing is the process of retrieving the data from the database. Magento needs to reindex the data which keep changing like price, cart amount, discounts, etc. Without reindexing, it has to calculate the price of each & every product along with the applied discounts. It can result in slow loading of price, thus leading to shopping cart abandonment which is always a matter of concern for online sites. In this case, you can manually reindex the data from Magento admin panel. Just go to ‘systems’, then ‘index management’, and then click on ‘reindex data’. Hit submit button and the reindexing will be done. Improve the Magento site speed by using its inbuilt cache management features. You can manage the options by following this path: Systems —> Cache Management. Do the changes you want and submit. The preferred cache setting for great results is APC + Varnish + NGINX + Memcache. This is the first step to improve the page load speed of your online website. Choose a fast hosting server before trying any other optimization technique. Do not opt for shared cheap hosting websites. Always go for a dedicated server. For your Magento store, a good hosting is necessary which should have a high-speed connection, high-security standards and a quick support in case of any downtime. You should know your hosting needs and your store requirements. Always do a check for uptime guarantees and host reliability. Why do websites use a CDN? The main purpose of a content delivery network is to deliver a high-speed browsing experience to your website users and to improve the page load speed of your website. 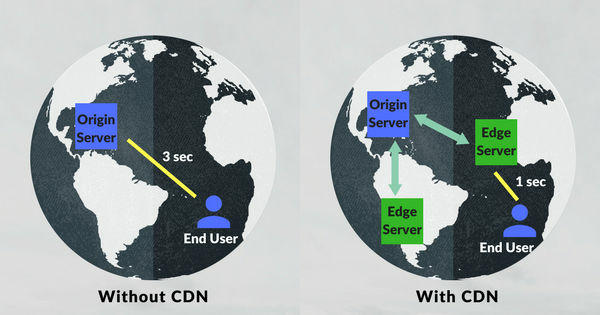 A CDN is basically a group of networks present across the globe in different regions to cater the browsing needs of your website users by delivering content from their nearest location. Thus, it helps in improving the page load speed of your Magento store and the bandwidth consumption also gets reduced. Let’s say, a user from Berlin access your website which is hosted in Dubai then if a CDN is implemented then the content will be delivered through the CDN server which is present in Berlin itself rather than delivering it from the main server, Dubai. It gives a fast browsing experience to your users. Images are one of the important aspects of a website when it comes to user engagement and website feel. And for an eCommerce website, these images hold a great significance as you can’t sell your products without including high-quality product images. High-quality visuals on your Magento store increase the user engagement rate & also help in boosting the conversion rate. But, on the other hand, heavy images can also slow down your website. Thus, it is necessary to optimize images on Magento store so that you can deliver a faster website with good quality images. To optimize images on your website, there are many ways. You can choose either to compress your images before uploading to the store using some tools like Tinypng or to optimize images real-time while delivering content with a CDN. You can also use ‘save for web’ option in Adobe Photoshop which can also help you to compress the size of images. Magento also provides many extensions to compress and resize images in its Magento Marketplace. The best way is to use real-time image optimization such as ImageKit. ImageKit provides URL based transformation and optimizes images across all platforms. It takes only 5 minutes to integrate a Magento store to ImageKit. These tips can help you to optimize your Magento store and can improve the page load speed of your website. An optimized online store provides a faster browsing experience to its users, therefore, experiencing a better engagement rate and conversion rate.